It is a widely held belief that the roots of what we today call Bellydance can be found in ancient fertility and birthing rituals. This may well be the case. Increasingly, modern women, midwives, doctors, and mothers are turning to Bellydance to help give comfort to pregnant women and to aid in and ease the birthing process. Regardless of the truth behind Bellydance's origins, the practical application of the dance form is one each woman may evaluate on her own. With the rise in Bellydance classes offered as a way to improve general fitness, some of the more empowering and, dare we say, spiritual elements may be lost along the way. In the experience of pregnancy and birth, many women report an inescapable sense of just these things. To join Bellydance and Birth seems as natural as joining fringe to a hip belt. The movements used in Bellydance and exercises taught in most Bellydance classes are predominantly involved in strengthening and increasing flexibility in the muscles at a woman's core: abdominals, obliques, and the pelvic floor. 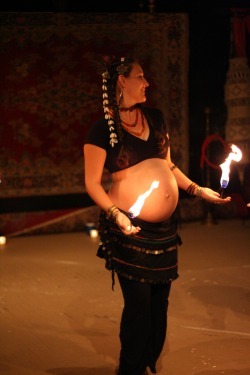 The rhythmic motions used in Bellydance are similar to those that many woman begin to do spontaneously during childbirth. Bellydance increases a woman's sense of balance while it improves tone and flexibility. Not only does the dance improve a woman's basic ability to balance, it teaches her how to shift and correct her balance as she moves through space--this is a skill many pregnant women find invaluable as their body grows and their center of gravity shifts. Improved intuitive balance may help relieve the backaches and lower body discomfort so often connected with the last two trimesters of pregnancy. While exercise is generally deemed a good thing for pregnant women, the type of exercise engaged in must be gentle on the body and put no undue strain on the mother or the growing fetus. Bellydance is a very gentle form of exercise, akin to low-impact aerobics, which allows a woman to work at her own pace and comfort level without elevating her heart rate above accepted levels. The increased blood flow during exercise increases the delivery of oxygen and nutrients not only to the woman's muscles, but also to her fetus. Naturally a woman needs to be careful to maintain her fluid intake (about 1 cup of liquid per every 20 minutes of exercise) and increase her caloric intake a bit. Studies indicate that women who have engaged in some sort of toning exercises before childbirth experience shorter, easier labor and recover from the stresses of childbirth more quickly than women who have not. The body-awareness emphasized in Bellydance may actually help a woman to take an even more active part in labor by tailoring her movements to those which will help position the child properly and ease its journey through the birth canal. One should have a conversation about exercise with one's doctor before beginning any new exercise forms, but modern medical research indicates that keeping active and working on strength and flexibility during pregnancy are positive choices to make. This ancient dance form can be advantageous to women both physically, mentally, and spiritually. Why not revel in your growing belly? Why not celebrate it with a dance form that glories in the magnificence of the female form? "In the Belly of the Goddess:Bellydance for Pregnancy and Birth"
I worried how my pregnancy might affect my dancing. How long would I be able to teach? Would I be able to dance in our Hafla? Would I lose my tone after I gave birth? As it turned out, I danced right up to my due date- in fact the last class I taught before "maternity leave" was my due date! Throughout my pregnancy I never suffered backaches, swelling, or the many discomforts all the books and my female friends warned me about. I attribute that to my continued dance practice. There were some things I couldn't do. Fast hip twists and sharp shimmies were rather uncomfortable. In class, I had to pull back on the stretching I could do. Due to the relaxing of the ligaments during pregnancy I chose to limit my stretching and not push very far. Although I had expected my undulations to disappear, they didn't. In fact, they got better! Despite advice I was given to stop doing undulations (supposedly they might bring on early labor, but I never felt even a twinge), I undulated right on through and I believe that the exercise helped my abdominal muscles recover that much more quickly after birth. My baby was very mobile in the womb and her position changed at each visit to the doctor. When labor began (finally) she was not in a good position at all and I had intense back labor. My midwife feared a C-section might be required because of the baby's position. I walked the halls of the Labor & Delivery wing and held onto the railing during my contractions. Squatting was far too painful but horizontal figure 8's with my hips (moving back to front) helped relieve the pain. Between the figure 8's and large hip circles, i was not only able to ease (some of) the discomfort of Transition labor, but I was able to help my baby reposition herself in the birth canal and have a natural childbirth without cuts, drugs, epidurals, or anything other than a birthing bar, supportive husband, mom & midwife, and belly dance skills. Post-natal I took a couple of weeks off but was back in the dance studio within a month of delivery and was performing again within two months. My ab work was not as strong as it had been, but as I write this with my 8-month old crawling around i think my dance skills are back where they were. There have been some lasting changes though. Most noticeably, my rib cage is wider than before the pregnancy which impacts my costuming (cholis are a wee bit pinchy now) and since I'm breastfeeding my cup size changes hourly--so, the coin bra *always* goes over a choli now! My stomach is...well...different, a little doughy and it pouches over my waistband in a way it never did before. And there are stretch marks; well-earned badges of my accomplishment!